While the logic of just giving your employees pay raises seems sounds (just hand over the money, and they’ll spend it on what they want), it turns out that many employees — especially those under 35 — are more interested in great benefits than high salaries. So why are employees leaning towards benefits over pay raises? And what are the benefits that your employees want? It all comes down to employees wanting to know that they can see a dentist or take a sick day when they need to without facing repercussions. Many employees are also parents, and they have kids to take care of. When employees begin to choose benefits over higher salaries, you can be sure it’s because they’re looking for more security and a better life-work balance. Health Benefits are the number one priority for most employees. A recent study showed that, of the just under 80% of employees who’d prefer benefits over a pay raise, 40% ranked better health insurance as their primary concern. This makes sense. Many Canadians are underinsured. That means that, while they do have some health coverage, they’re paying out of pocket for a lot of the services they’d like to access. We suggest adding dietitians, nutritionists, and massage to the list of professional services you provide employees. Paid Vacation followed just behind health benefits with 38% of employees wanting more paid vacation. 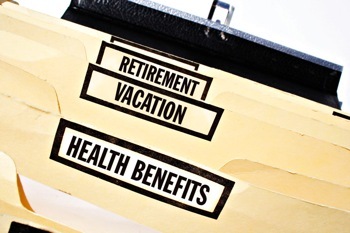 From a health standpoint, paid vacation just makes sense. Employees who can’t afford to take time off are more stressed out. Stress causes employees to be less productive, more prone to illness, and unmotivated at work. Vacations give employees an opportunity to unwind and relax. They return more focused and ready to get back to work. There are ton of benefits that your employees may prefer to a pay raise. Better health plans, paid vacation, paid sick days, and extra help with their retirement pension are all important benefits that today’s employees are looking for. If you want to retain the best talent, it’s important to know what your employees actually need and desire. Ready to give your employees a better health plan? Health Risk is here to help! Contact us today.